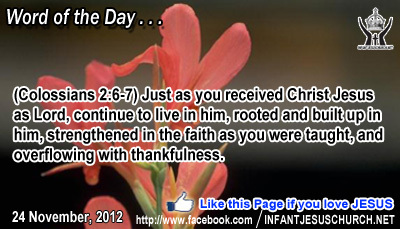 Colossians 2:6-7: Just as you received Christ Jesus as Lord, continue to live in him, rooted and built up in him, strengthened in the faith as you were taught, and overflowing with thankfulness. Heavenly Father, we thank you for the straightforward, challenging and everlasting truth of Jesus' Lordship. Through you Spirit, we pray that you will validate our life to more closely reflect his lordship in our work place, our family, and our daily influence. In the name of the Infant Jesus we pray. Amen. 27There came to him some Sadducees, those who say that there is no resurrection, 28and they asked him a question, saying, "Teacher, Moses wrote for us that if a man's brother dies, having a wife but no children, the man must take the wife and raise up children for his brother. 29Now there were seven brothers; the first took a wife, and died without children;30 and the second 31and the third took her, and likewise all seven left no children and died. 32Afterward the woman also died. 33In the resurrection, therefore, whose wife will the woman be? For the seven had her as wife." 34And Jesus said to them, "The sons of this age marry and are given in marriage; 35but those who are accounted worthy to attain to that age and to the resurrection from the dead neither marry nor are given in marriage, 36for they cannot die any more, because they are equal to angels and are sons of God, being sons of the resurrection. 37But that the dead are raised, even Moses showed, in the passage about the bush, where he calls the Lord the God of Abraham and the God of Isaac and the God of Jacob. 38Now he is not God of the dead, but of the living; for all live to him." 39And some of the scribes answered, "Teacher, you have spoken well." 40For they no longer dared to ask him any question. The Sadducees came to Jesus with a testing with question to make the resurrection look unreasonable. The Sadducees, unlike the Pharisees, did not believe in immortality, nor in angels or devils. Their religion was exactly grounded in an earthly image of heaven. Jesus retorts by dealing with the fact of the resurrection. The scriptures give proof of it. In Exodus, when God manifests his existence to Moses in the burning bush, the Lord tells him that he is the God of Abraham, Isaac, and Jacob. He demonstrates that the patriarchs who died hundreds of years previously were still alive in God. Jesus defeats their disputes by showing that God is a living God of a living people. God was the friend of Abraham, Isaac, and Jacob when they lived. That companionship could not cease with death. As Psalm states: I am continually with you, you hold my right hand. You guide me with your counsel, and afterward you will receive me to glory. The ultimate proof of the rebirth is the Lord Jesus and his victory above death when he rose from the tomb. May the Infant Jesus open the eyes that are concerned not with the present but with what is yet to come, may He unseal the heart's vision, that we may gaze on God in the Spirit, through the same Jesus, whose glory and power will endure throughout the unending succession of ages.